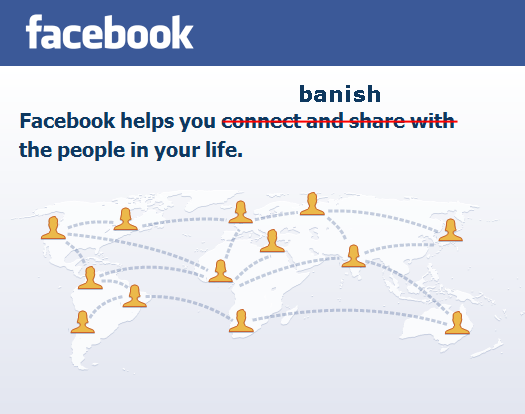 Facebook introduced a new friend management feature Wednesday that may help you Spring clean your News Feed by banishing more people to the quiet corner of space where no one can hear them scream. 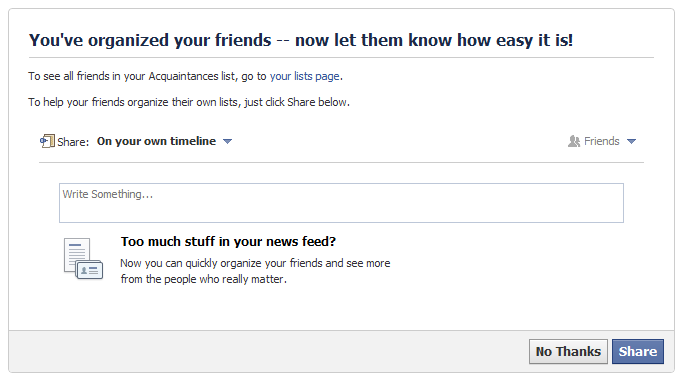 This also is known as the Acquaintance List, a Google+ inspired cataloging option that Facebook added last September. The Acquaintance List suggester is great if you don't want to unfriend by the dozens but your News Feed has become crammed with the inconsequential ramblings of half-remembered people … even if shrouding these people is, by definition, an antisocial thing to do, and slightly contradictory of Facebook's motto of helping you "connect and share with the people in your life." Once these former friends are secretly shuffled away (Facebook won't inform them, so you can avoid repercussions), their posts won't show up in your News Feed as often. You can also now take advantage of your newly organized feed with Facebook's new sharing feature: "Friends Except Acquaintances." Like so many of Facebook's other settings, the Acquaintance List suggester is somewhat buried in links, tabs, and settings. To access it, visit your Friends page, click Acquaintances, and then you'll see a sidebar on the right suggesting people to add. You can expand that list by clicking the "see all suggestions" link or by visiting "Too much stuff in your news feed?" Then you'll be taken through a gallery of the dejected in four steps: college, high school, your current city, and the random people you've picked up over the years. They'll be all lined up and ready for judgment based on the amount you interact with them on Facebook. Too much stuff in your Facebook news feed? The final twist of the knife comes once you're finished, and Facebook asks if you'd like to post the "Too much stuff in your news feed?" link on your wall, which announces to everyone loud and clear that you've had enough with their posts about sandwiches and cats and cats eating sandwiches and you're not going to take it anymore.